A brief "goes back testicles", it is the concept presented by the group finistérien "Thomas Bouloù" ("tomma bouloù" in Breton means "back-neck") during the day of information organized in Rennes by the family planning, according to our colleagues from Telegram. This meeting was held on March 10th and its theme was "Contraception for all". 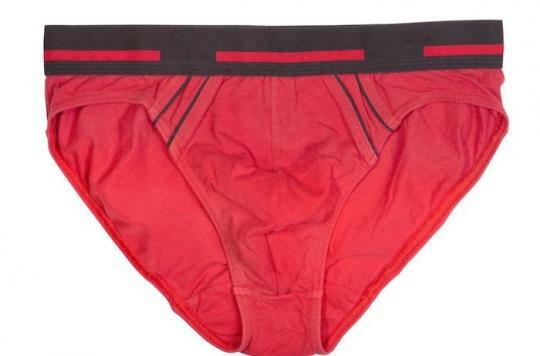 This warming underpants, developed by a Toulouse doctor in the 1980s , is "an underwear that is used to raise the testicles against the body to put them at body temperature, because the heat inhibits the manufacture of spermatozoa. The idea is to wear this slip at least 15h per day . The process is effective after 3 months. When you stop wearing it you become fertile again after 3 months, "says Aurélien Le Gall, a member of the collective Thomas Bouloù. Currently there are 4 methods of male contraception. The vasectomy simple surgery, fast and refunded which consists in sectioning the vas deferens. The thermal contraception is based on bringing the testicles closer to the body so that the spermatozoa are destroyed by a higher temperature. In order for the heated underpants to be effective, it must be worn for about 15 hours a day every day. No side effect, it requires a month and a half to 2 months of use for contraception to be considered effective, which is verified by performing spermogram every 3 months. The hormonal injection is a method of injecting a hormone that blocks the production of spermatozoa, the contraceptive effect being obtained between 1 and 3 months. Finally the external condom remains the most used means. If the principle of disrupting spermatogenesis by warming the testicles has been known for years, the relevance of its use in contraception is discussed by the experts. By the admission of its promoters, it is necessary to wear this slip at least fifteen hours a day and for 3 months before observing an effect on the spermatozoa. Constraints that leave doubt on the efficiency and reliability of this "natural" technique. Are you interested in this subject? Come and discuss it on our forum!